After a trial run for Southern Kings v Leinster, we're having a second go at what we call a "real time writeup". Win by at least 30, win 100% of set pieces. They're the basic targets for me going into this last November internationals of 2018. In my preview I pointed to John Cooney and Tadhg Beirne as players I'd be interested most in seeing tonight as both are capable of pushing their way up the pecking order despite the talent above them. Hopefully the USA put up a good show, I don't know much about them apart from skipper Blaine Scully but they are on a good winning run themselves. 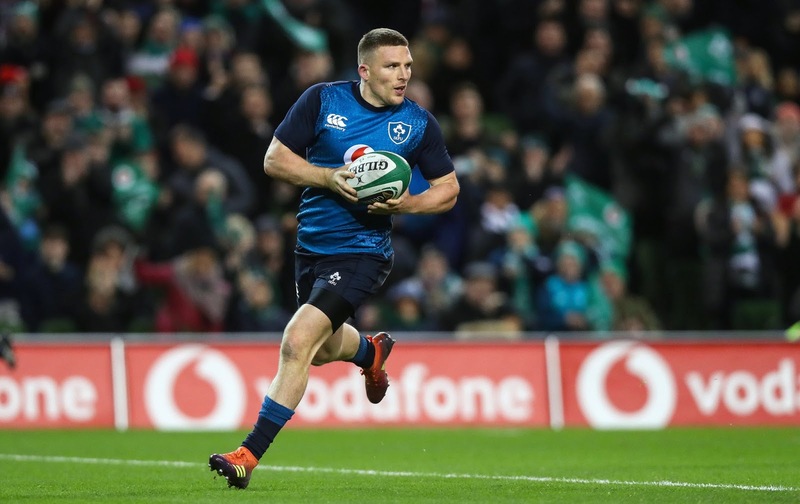 TRY IRELAND Standard Irish exit after receiving kickoff, a couple of box kicks come back to us before Andrew Conway jinks his way through some space before combining brilliantly with Rhys Ruddock and getting it back to run in our first try on just 3m. Carbery converts, 7-0. Exit doesn't work off next restart and we get into choke tackle at 22. USA attack off the scrum but a nice rip from Henderson wins it back and we clear. USA attack some more from the lineout before winning a penalty at the 22, kickable in front. Shocking kick from Magie goes wide. More USA pressure in the 22 but Jordi snaffles it from an unprotected breakdown and we clear again. Restart almost won back but foot in touch lineout to USA. Off the restart we run into another choke tackle near halfway. USA press off the scrum but it's well tidied at the back by Addison. Ireland pinged at the lineout Beirne interfering with the catcher, USA kick for the corner. Lineout maul has a great shove and referee awards a penalty try 14-14, Henderson gets yellow for pulling down the maul. Sweetnam off, Ross Byrne on to out half, Carbery to 15, Addison to the wing. USA knock on off a lineout at midfield, another chance for Ireland to kill the sinbinning some more. Ireland win a penalty at the scrum. Massive maul deep into USA half, win a penalty, Ross Byrne kicks for touch in 22. Lineout overthrown and knocked on. Ieland get one last chance for phases and keep the half alive before winning a penalty at midfield which gets kicked for touch at 22. Lineout lost again, USA close out half. Experience of games like these has told me that we might be nervous coming up to half time that enough breakthroughs haven't been made, but even if so we should be able to pull away in the second half. Pretty much as I expected in my preview so far...we have to remember these second string teams include a lot of untried combinations. Have to put faith in Joe's ability to work his halftime magic and hopefully we can start pulling away soon. Ringrose crash ball into 22 but Conway knocks on following up. As the scrums reset, the crowd does a Mexican wave. Ireland win another penalty scrum, still no yellow? From lineout, exchange from Byrne to McClockey goes wrong. Carbery tries a chip, it nearly bounces for him but it finds touch. Obviously getting a hat-trick is a good way to earn a man of the match award but while Conway had a good outing I actually thought Gary Ringrose deserved it more. He just found ways to show his class was apart from those around him, but I wouldn't dispute the decision too much. John Cooney played well within the system but I wonder if that took from his game. He looked as though he was making a conscious effort not to make his sniping runs so if he's not allowed to bring that to the team then I wonder if he will be able to move up the pecking order. Tadhg Beirne was a bit below par I thought, not that he wasn't effective at times but he was outplayed by Henderson IMO and was trying too hard to steal lineouts, getting pinged in the process. All in all a satisfactory result for Ireland...for now the lighthearted debate left to settle is over whether or not we like the jersey they had on while the serious one is about whether or not Joe will stay! Hopefully the latter decision will be the one all of Irish rugby wants, though the body language isn't looking too good. Mick Keogh To be fair to the Eagles, they managed 2 more tries than the All Blacks did against us. Paul Smith Work ons but in the end job done professionally enough. Fair play to Conway who deserved his hat trick and was pretty unselfish all round. Ringrose and Ruddock were excellent too. Have to say Henderson is playing himself out of the squad and I think Roux is ahead of him now. Also thought Cooney was poor, awful kicking and very slow at the breakdown. McGrath looked head and shoulders above him when he came on. @IrishRugby very clinical in the second half as expected. Some excellent performances, notably from Conway, Addison, Ross Byrne and Ruddock. Both our front rows excelled. How good was Ryan when he came on? Martin Loughrey Job done. We put out the almost B team against a tier 2 team, but one that's on a roll. The Eagles are in their highest ranking ever and have made a habit of winning this season. All told a good result and a good night out for a number of fringe players looking to break through. Michelle Tobin Agree Henderson is playing (or fouling) himself out of the squad. Not an ideal first half but we found our groove well. At least a handful of players put their hand up for selection and Joe's biggest selection nightmare will definitely be the back row. Interesting to see that it was Garry Ringrose who called the rest of the team under the posts after the try and give them a bit of a bollicking. Really growing into a leader.